An interesting read which does a great job of making abstract concepts of happiness concrete and actionable through real world examples. Helpful to be aware that happiness tends to come from a balance of both inner and outer factors such as being grateful, not being attached to results, helping others, etc. Happiness comes from within so break your dependence on people and events. Try to take traumas in stride and learn from them. Left vs right. Left side of your brain is more for language processing and right side for distinguishing patterns. Confabulation is the concept that people come up with reasons for what they do for everything, even if don’t truly know why they did something. New vs old. New brain used for more complex tasks, patterns, expansions of emotional range, etc. whereas old brain is more primal and instinctive. Controlled vs automatic processes. Subliminal messages about professors make you smarter and if image shows soccer hooligans, it make you dumber. These subliminal images have shown that they have a noticeable effect on how we think and proves that most mental processes are automatic. Failure of self control- marshmallow experiment of delayed gratification. Help self-control by avoiding negative stimuli or changing it when it is around. The cortical lottery – some people are born with a more negative mindset than others and genes have more influence upon our happiness than most people realize. 3 ways to change thoughts and brain function – meditation, cognitive therapy and Prozac. 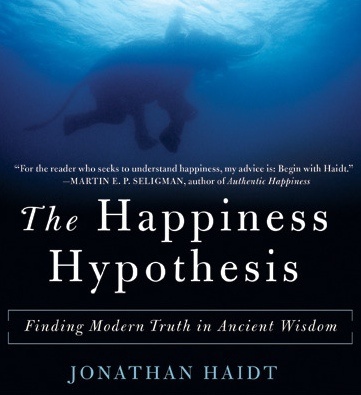 This entry was posted in Books and tagged Happiness, Jonathan Haidt, Self-help on November 15, 2014 by Blas.